Workers inspect the Freedom Industries storage facility in Charleston, W.Va.
Freedom Industries, the company whose chemical spill last week caused widespread contamination of West Virginia water supplies, filed for Chapter 11 bankruptcy court protection Friday. The company, which is based in Charleston, W. Va., where the spill occurred, estimated it has assets of between $1 million and $10 million, but that it has liabilities within the same range. The company's filing doesn't provide extensive details on last week's spill. 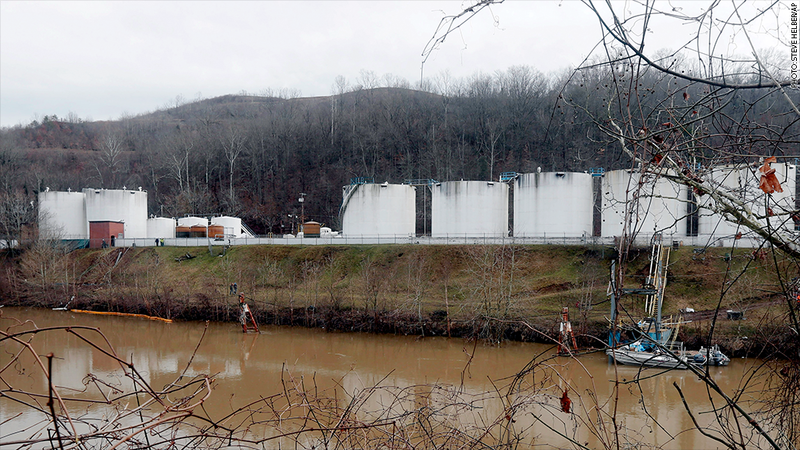 The document says it's "presently hypothesized" that the break of a local water line near the Charleston facility may have contributed to the freezing and rupture of a chemical storage tank that then leaked into the Elk River. The chemical in question -- methylcyclohexane methanol, or MCHM -- is used by Freedom's customers to treat coal during the coal preparation process. The disaster resulted in a state of emergency in nine West Virginia counties, causing the loss of water supplies for roughly 300,000 residents and the shuttering of a number of businesses in the affected area. A bankruptcy filing could protect Freedom's assets in the case of court judgments against it. A person who answered the phone at Freedom Industries on Friday declined to comment. Related: New health hazard, same story in West Virginia? The news came Friday as West Virginia authorities announced that thousands more water customers have been given the green light to resume using tap water following the spill. The end of the "do not use" order for residents in the West Virginia communities of Eskdale, Leewood, Ohley and Elkview means more than 220,000 of the approximately 300,000 people originally affected by the incident have been cleared to resume using tap water. That number was further increased Friday afternoon, when all customers in the Kanawha Valley district were given the all-clear. Officials detected the 7,000-gallon leak eight days ago, on Jan. 9. More than 7,000 gallons of the coal treatment chemical leaked into the river, officials say. Environmental authorities say the amount of the chemical in the water has fallen to well under 1 part per million, the level deemed safe for consumption by the Centers for Disease Control and Prevention. A later advisory suggested that pregnant women should continue to avoid drinking the water. Concern lingers among many affected by the spill, some of whom say they will not drink the water out of fear that scientists know too little about the long-term effects of the chemical, which is not routinely tested for in water supplies. "If a pregnant woman can't drink this ... no, we're not feeling safe here in West Virginia," Charleston resident Jacqueline Bevan said Thursday. CNN's Miriam Falco, Dana Garrett, Catherine E. Shoichet, Jean Casarez and Ashley Fantz and CNNMoney's James O'Toole contributed to this report.